Anežka Hošková´s work is close connected with visual elements of musical subcultures and fashion, actually also with post-internet experience. Her older works were mostly made in medium of painting. In her last works she developed interesting mixed media language, which combines painting with stage installation and performative participation of artist herself. Her realisations can reminds us ritualistic forms or witchcraft. In her actual realisation she continues in her work with multicultural intermixing of symbols and with merging borders between high art forms and subculture styles. Lucie Mičíková interests are mostly based in the history, forms and broader social and aesthetical context of modernistic architecture. Her works uses topics from this area in usually paradoxically fragile and flat realisations. Her collages, drawings and installations are pictorial games with forms, its meanings and abstraction. In her actual works she often gains inspiration from work and ideas of Buckminster Fuller, important visionary of modernistic architecture and engineering. Exhibited work will be realised in her favourite form of mural intervention and painting. 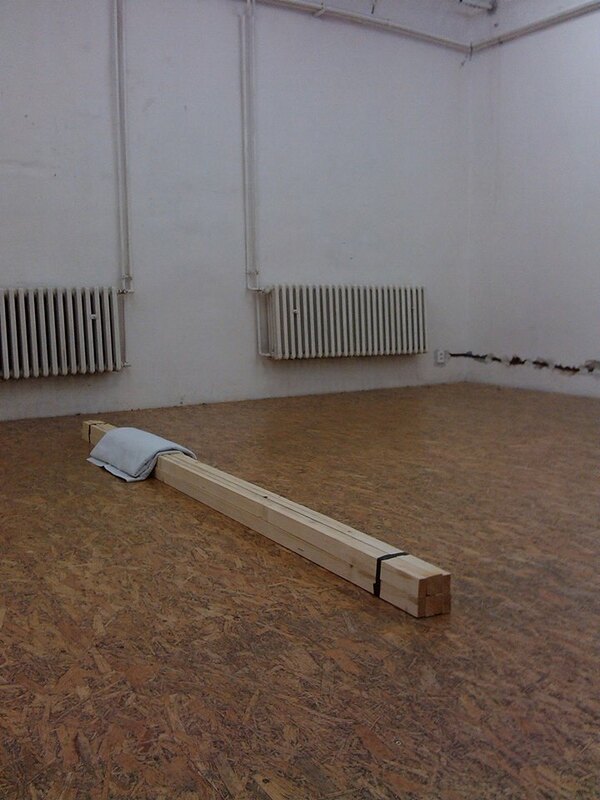 Petr Krátký is in his work oriented towards performativity, appropriation of works by another artists and at last, but not least, in humorously and ironic game. His main medium of presentation is Video Art and Installation, but equally important is author himself, with his performer abilities. Viktor Takáč’s work is significant with its deep formal insight into format of medium and it’s representation. His main interest is also located in Video Art, but his precise attitude and different, dry irony, makes his work more distanced, less bodily and more connected with visuality and visibility itself. The cooperation of Petr Krátký and Viktor Takáč was inspired by similarities in their creative attitudes. Both of them are interested in ironic game with spectator and with crossings of medium borders. Its result is this show, presented on stage in theatrical manner. With two actors, few theatrical properties and lighting, it may seem from the beginning as old school performance. But spectators can be little surprised.